‘Weeds are travelers of the plant world.’ In Weeds of Dewey-Humboldt, Arizona, author Garry Rogers speaks about the role of weeds and his final definition of weeds: ‘Their role is to fill the empty spaces of the earth, to repair vegetation shattered for millions of years by landslide and flood and forest fire, and today degraded by aggressive farming and gross pollution. In so doing they stabilize the soil, conserve water loss, provide shelter for other plants and begin the process of succession to more complex and stable plant systems.’ The book gives a better understanding about weeds and how invasive weeds can be a big threat to nature as they absorb nutrients and moisture quickly. 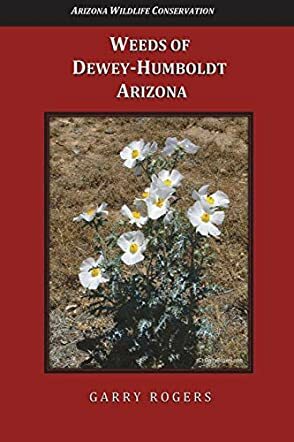 The author has handled this topic extensively and includes drawings, dimensions, descriptions, and photographs of 149 weed species. The topic is fresh and the book is informative. Readers get to understand how weeds are essential to healing processes that replace lost soil after a landslide, provide for wildlife, and some of them are food and medicine for people. Because of their ability to withstand harsh conditions, it is said that weeds will proliferate as global warming intensifies. The author makes the book appealing by adding colorful pictures and he has classified these weeds under: A=Annual, B=Biennial, P=Perennial, D=Delightful, E=Edible, F=Future Colonist, I=Invasive, M=Medicinal, N=Native, P=Painful, T=Tough. The glossary at the end of the book is helpful when it comes to understanding the terms used in the book. It is a good book to have in school libraries as students, teachers, and educators will find it useful for reference material. I found the book interesting and informative, the author gives good insights about weeds, and it speaks about a topic that is a part of everyone’s daily surroundings yet remains unexplored to a large extent.